Utica click style torque wrenches are built to exacting standards to maintain maximum accuracy. Only top grade materials are used in Utica click wrenches. Working parts are heat-treated to increase durability and service life. Each wrench is tested with equipment traceable to NIST standards. Because of a high commonality of parts, the procedures for calibrating Utica click wrenches are the same from the smallest to the largest wrench in our product offering. This saves the operator time and the expense of developing specific procedures for different wrench sizes. Utica's audible ''click'' plus a few degrees of travel provides a simple, quick indication that the operator has achieved the predetermined torque setting. All Utica click wrenches incorporate a patented, low friction torque control mechanism that produces highly accurate readings in clockwise and counter-clockwise directions. Plus, a patented, spring-loaded locking collar locks the scale on the desired torque setting. This prevents the operator from accidentally using the wrench in the unlocked position. Dual Scale Models: Either in.-lb./Nm graduations, or ft.-lb./Nm graduations. Audible ''click'' and/or a few degrees of travel provide simple, fast indication of micrometer accurate torque settings. Patented, low friction torque control mechanism produces accurate readings in either direction. Accuracy is + 4% of setting right hand (clockwise) and + 6% of setting left hand (counter-clockwise) within upper 80% of scale. Two calibration adjustments (major and fine) permit easy and precise torque settings. 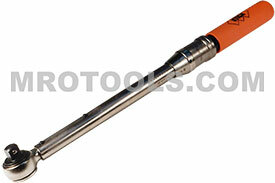 Most conventional torque wrenches have only one adjustment. Dual scale models give readings in in.-lbs./newton meters or ft.-lbs./newton meters. Patented spring-loaded locking collar locks scale on desired reading and remains in locked position. Wrench cannot be left inadvertently unlocked. Heavy-duty, reversible ratchet models have quick-shift lever to allow easy single-hand shifting. Slim, lightweight design reduces fatigue and facilitates use in confined work areas. Store all adjustable models at their lowest torque setting. Calibration certificate can be requested when ordering. Note: Unless otherwise specified, all Utica micrometer adjustable torque sensing wrenches are calibrated for use in both left and right hand directions. As a general rule, we recommend calibrating Utica torque products every six months. However, the quality objectives of the operators organization will ultimately determine the frequency of tool calibration. The TCI-250R Utica Ratchet Head Torque Wrench is one of thousands of quality tooling products available from MRO Tools. Please browse Utica Ratchet Head Series Torque Wrenches for tools similar to the TCI-250R Utica Ratchet Head Torque Wrench. TCI-250R Utica Ratchet Head Torque Wrench description summary: Utica ratchet head ''click'' type torque wrench. Drive Size (in. ): 3/8'' Range .in-lb. : 50-250 Range Nm: 5.65-28.25 Graduations in.-lb. : 1.0 Graduations Nm: 0.113 Length in. : 12.5 Length mm: 317.5 Weight lb. : 3.0 Weight kg: 1.4 Quantity discounts may be available for the TCI-250R Utica Ratchet Head Torque Wrench. Please contact MRO Tools for details.